My sister is having her first baby. 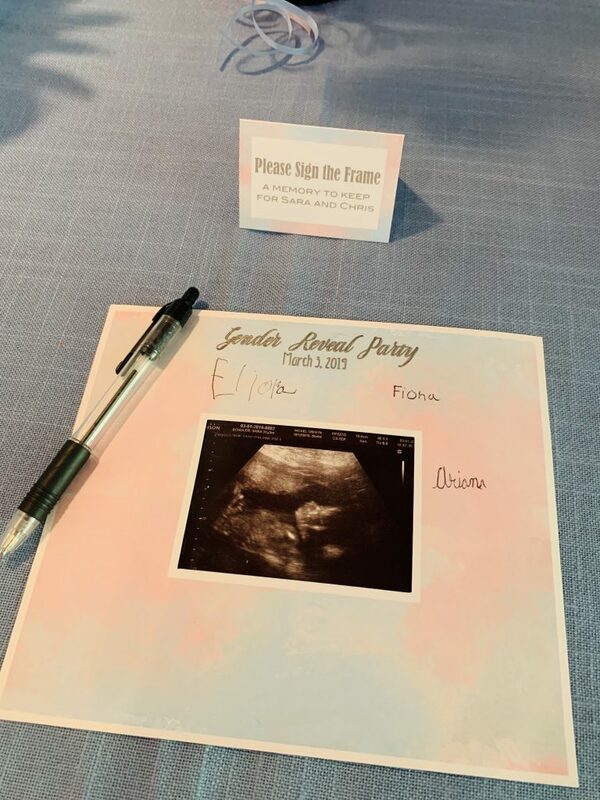 I’m so excited for her, and I was honored when she asked me to throw her a Gender Reveal Party. 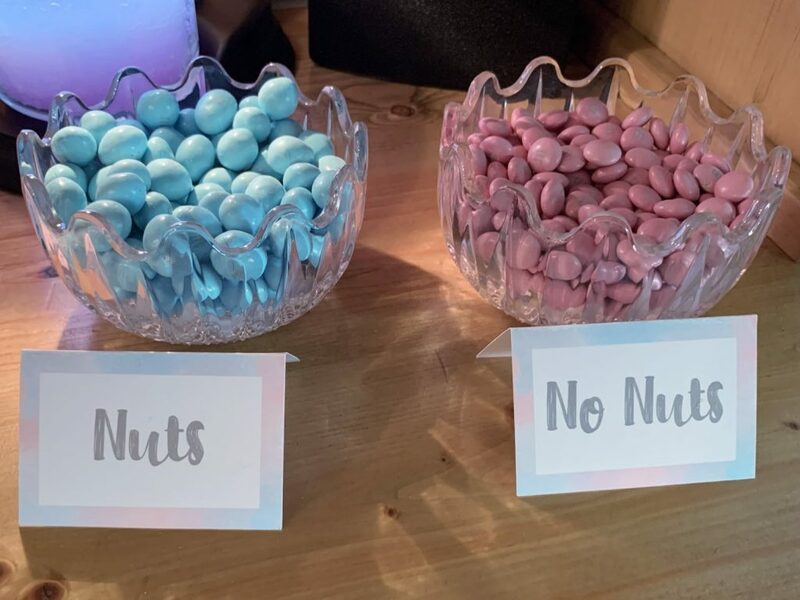 I truly enjoy getting creative and making party decorations. Silhouette Studio is my favorite design software. I use it all the time, even if I’m not going to use my Cameo to cut things out. 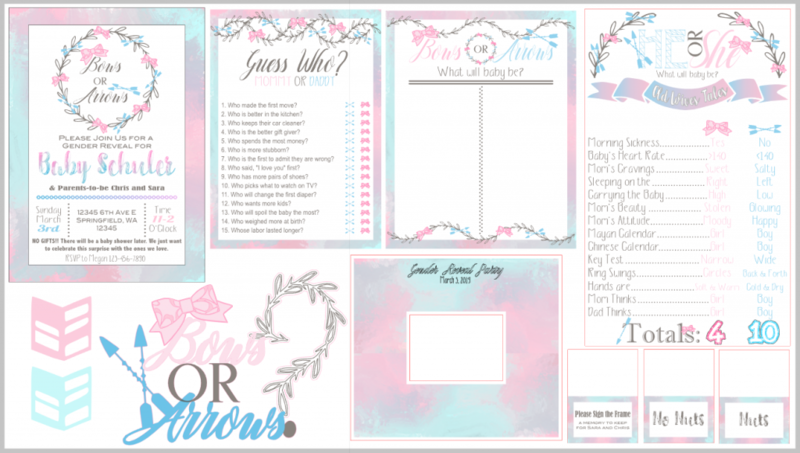 For me, the design process always starts with the invitations, to set the mood and theme of the party. And, then I use the invitations to make almost everything else. 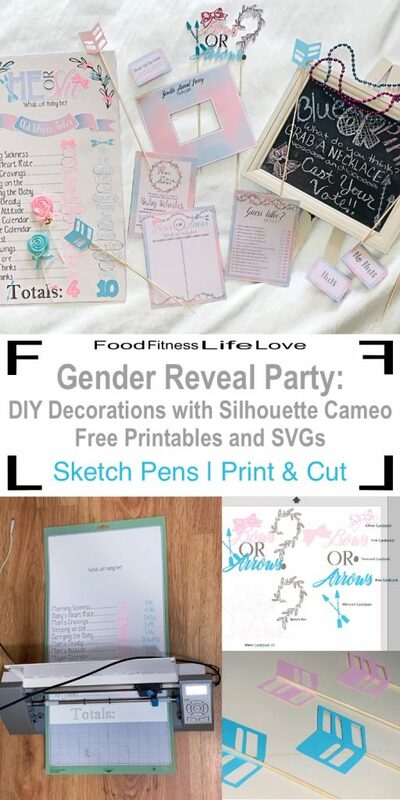 A PDF printable fill-in version of the invitation is at the bottom of the post. 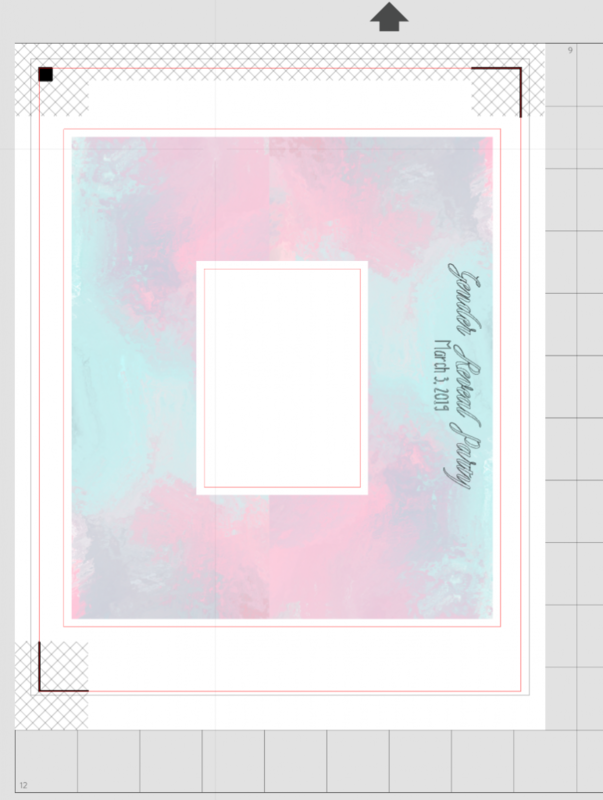 To create the invitation, I used a marbled background and put a white rectangle on top of it, creating the border. 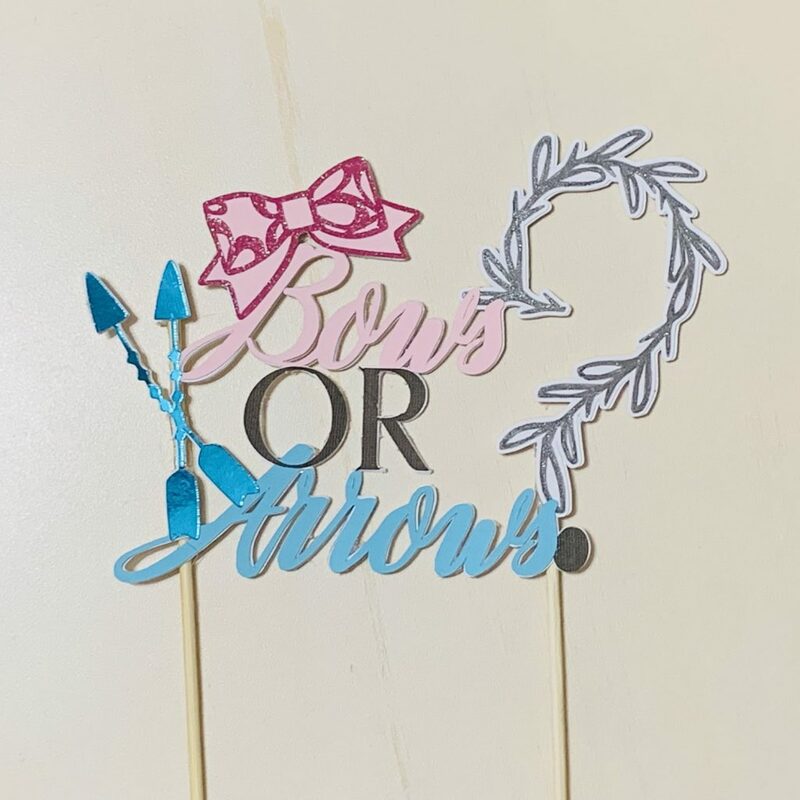 My sister and her husband picked Bows or Arrows for their theme. There are lots of cute ideas on Pinterest, but I wanted to make my own. Ultimately, I liked the soft sweetness of the leafy wreath decorated with the bows and arrows. Then, it was just a matter of filling in the important party information and picking my project fonts. I call them my project fonts because I used them in everything I created. I also reused the same bows and arrows elements to make it all cohesive. The ombre effect in some of the elements and fonts was created using a gradient fill pattern and picking the colors under the Advanced Options tab. Once, I had my sister’s final approval on the invitation, I went to work designing everything else. Actually, I should say we did. For the first time ever, my 10 year old and 8 year old, sat with me at the computer and helped me during the design process. This made the whole project so much more special to me, to share something I really enjoy with them. 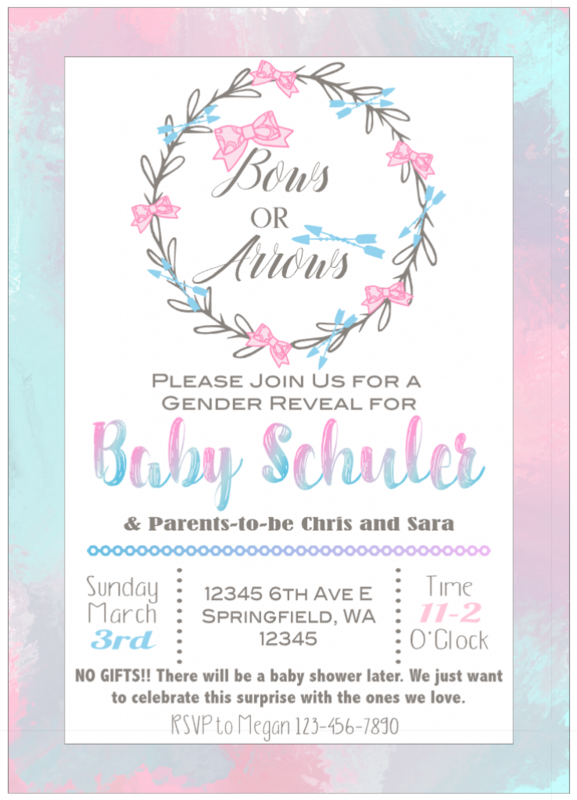 We spent time rotating bows and arrows until they were just right, changing colors and picking fonts until we knew that we had created something special to bless my sister (and their aunt). As you can see, we used the same fonts, colors and design elements over and over again in different ways. After the invitation was finalized, the rest came together quickly. 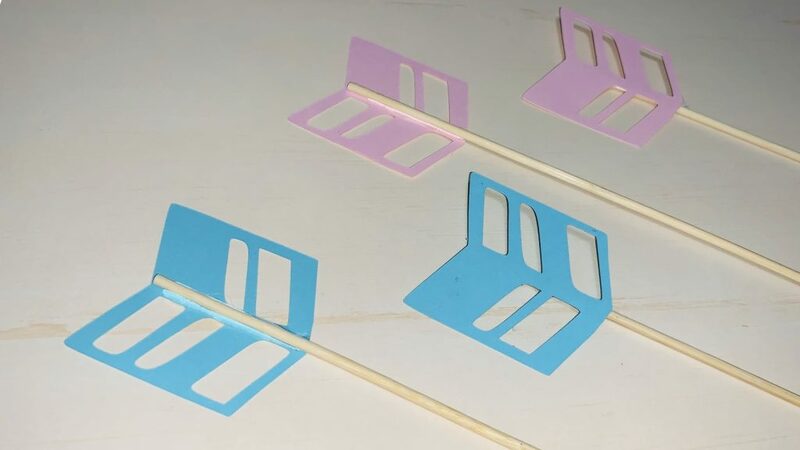 Making these arrows skewers is very simple. In Silhouette Design Studio, I filled the page with the design above. 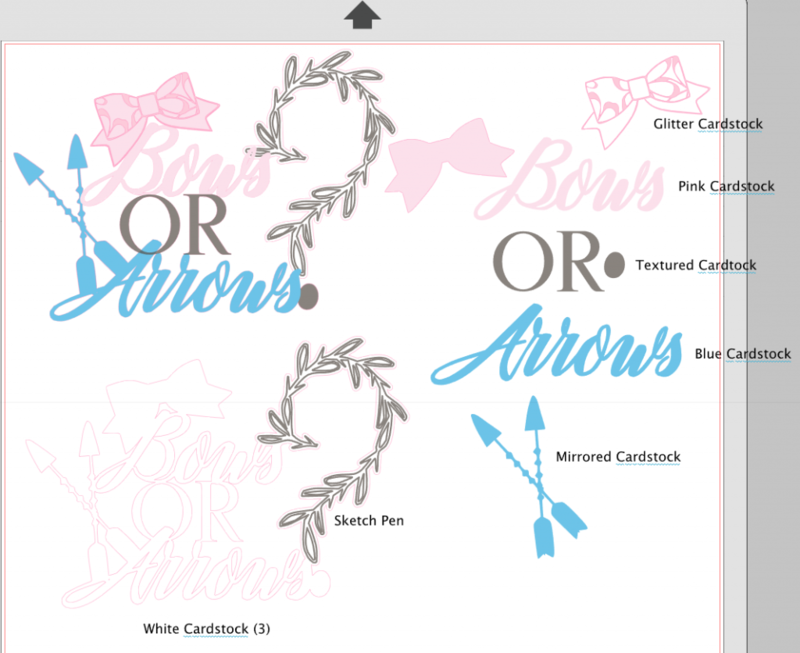 The arrow tops are 2 inches wide, and I can fit 15 in 1- 8 1/2″ X 11″ page. 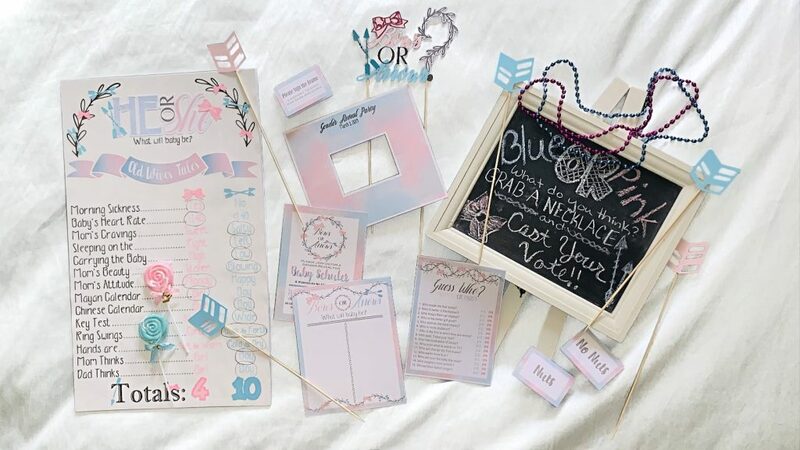 To match the party theme, I used pink and blue card stock. Then, I used hot glue to glue the wooden skewers on. I placed a line of hot glue down the center of the arrow-top and set the skewer (blunt side up) in the glue and held it for a few seconds. I like the hot glue because it’s set almost instantly, and it doesn’t make the paper bubble or warp. Originally, when I was planning this party, I wanted to have the skewers in a watermelon. But it’s not the time of year for watermelon, so I couldn’t find any. 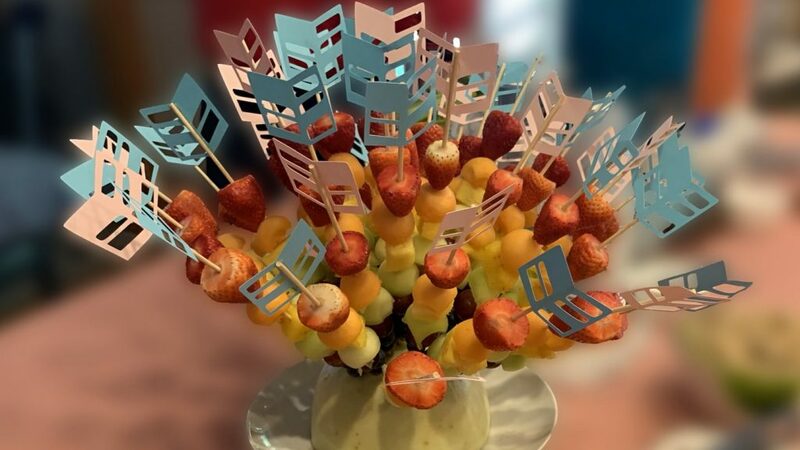 I went with the honey dew melon instead, but I wasn’t sure if it would hold all my skewers. So, I pre-poked all the skewers (with the pointy side) in the melon without any fruit on them. This actually turned out to be very helpful, and I will do it again next time. Having the holes already in the melon made it so much easier to put the fruit-loaded skewers in. And, I already had my random arrangement of colors. My daughter helped me pull the skewers out, load them up, and put them back in the same place. Just an FYI, half of a honey dew holds about 35 skewers very nicely. Making cake toppers is something I really enjoy doing. It’s pretty easy, and it’s so personal. I think it makes a cake that much more special. For the design, I wrote out the saying using my project fonts and made sure the words overlapped a little. I also added in the bows and arrows I’ve been using for all the decorations. The question mark required a little more work, but it’s not too hard. I took the leafy wreath from the invitation and sliced it into small pieces using the knife tool in Silhouette Studio. Then, I rotated the pieces around one at a time until I got the question mark shape. Finally, once all the pieces were where I wanted them, I welded them together (Object -> Modify -> Weld). And I used a circle for the dot. The leafy design is very intricate, so I created an offset line around it using the offset tool. To put the cake topper together, first I grouped the whole design together (first making sure all the elements overlapped just a little). 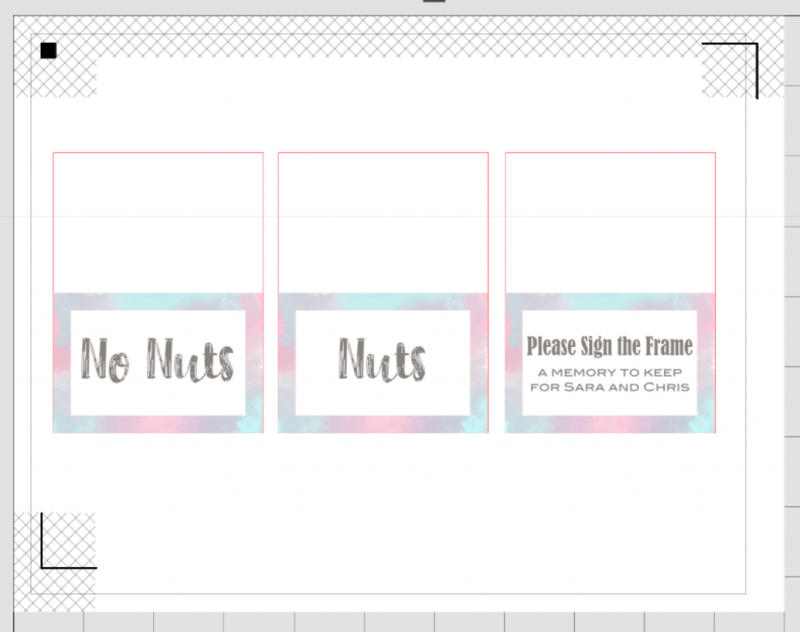 Then, I offset the design with an offset distant of 0, which basically just traced around the whole design (the image in the bottom left corner of the Silhouette Studio Screen Shot). To give the cake topper strength and stability, I cut 3 of these outlines out of white card stock. On one of the outlines, the Silhouette Cameo drew the leafy question mark using a sketch pen before cutting out the card stock shape. 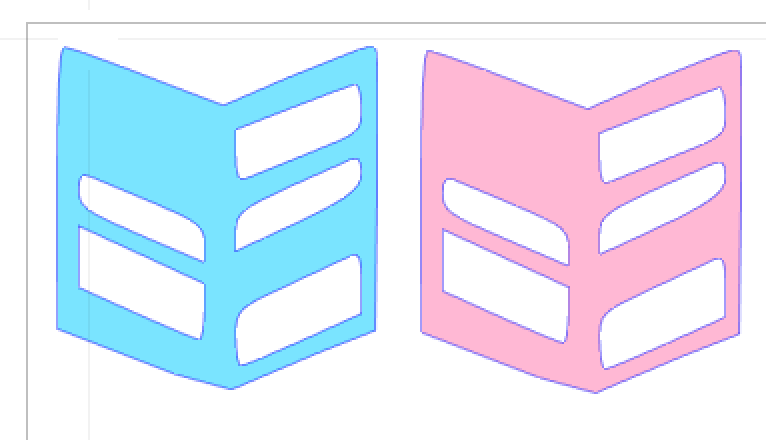 The rest of the shapes I cut out as indicated with glitter card stock, pink and blue card stock (the same as the arrow tops), textured grey stock and mirrored card stock. 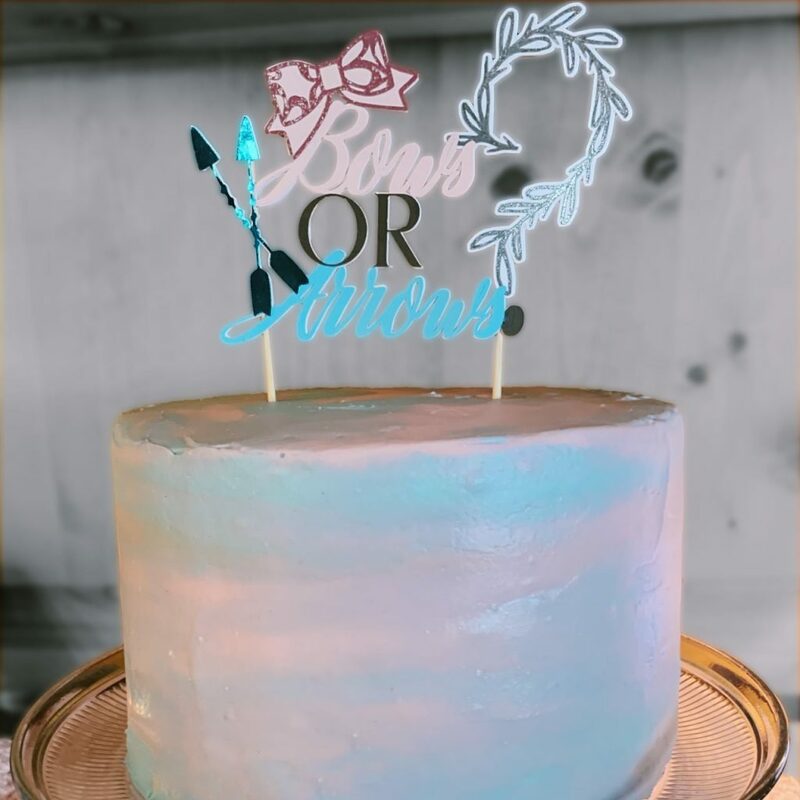 To build the cake topper, I glued (with scrapbooking glue) one white outline to the back of the outline with the sketched question mark. Then, I layered on top the rest of the colored card stock elements. Next, I turned the cake topper over and hot glued two wooden skewers to the back (in the least visible spot on the sides for the most support). Finally, I used the scrapbooking glue again to glue on the last white outline piece covering up the wooden skewers on the back side. These two pages were pretty simple to make. I used the same border and fonts from the invitation. I created the leafy decoration by slicing the wreath from the invitations into pieces using the knife tool in Silhouette Studio. Then, I rotated and flipped the pieces to create the wave pattern and finally welded them together when they were in the right place (Object -> Modify -> Weld). 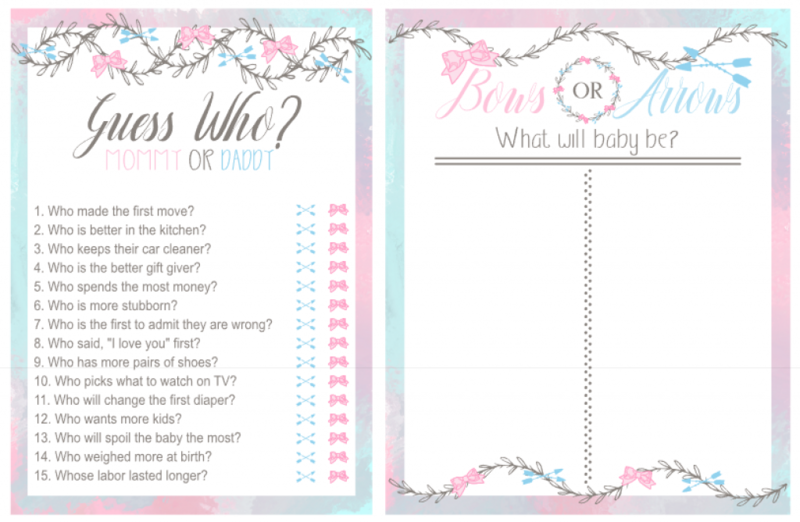 PDF printables of the game and vote page are at the bottom of the post. I printed multiple copies of the Guess Who? game on copy paper (2 per page) and cut them with my paper cutter. 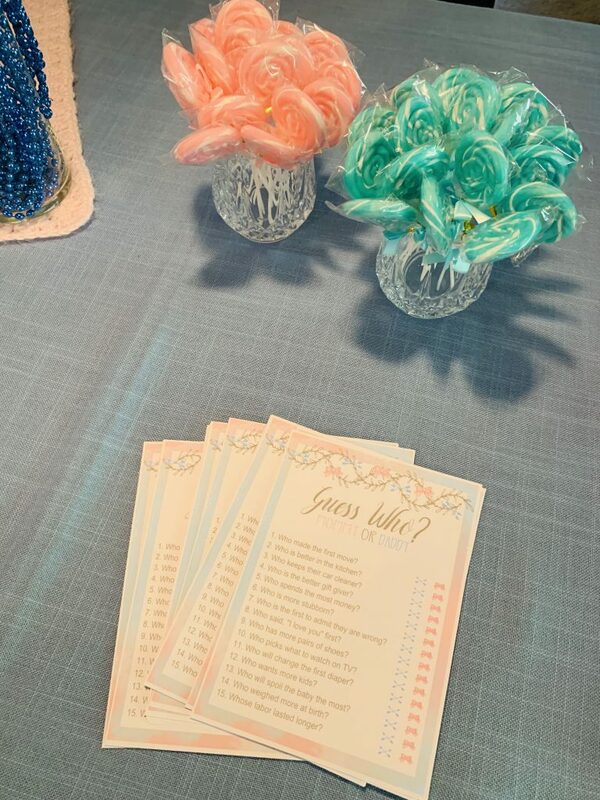 These sat out of the table for party guests to fill out and later Mom and Dad told us the answers. The vote tally sheet is designed to be a keepsake, so I printed in on card stock. 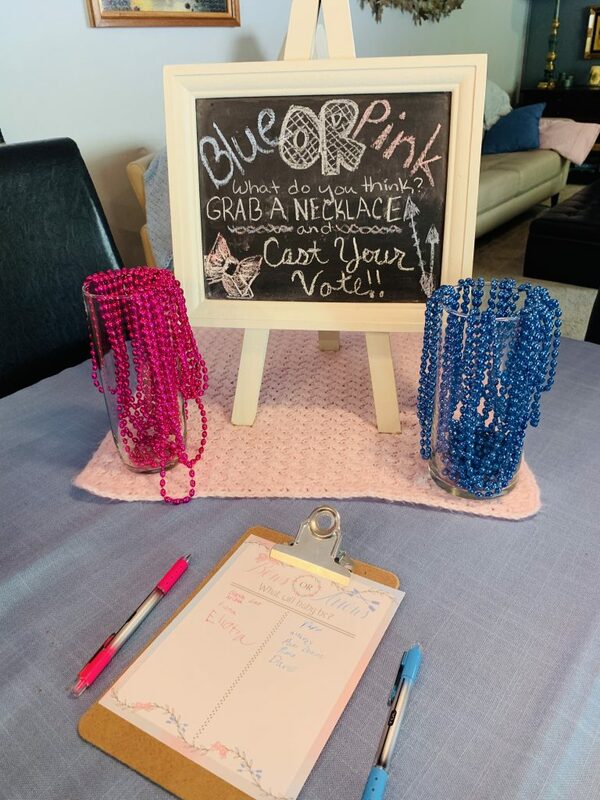 We set out pink and blue pens for party guests to cast their votes, and it will go in baby’s scrapbook or baby book as a fun memory. Tent cards are a fun and easy way to decorate for a party. I’ve used them many times to help label food or give directions to party guests. And they are super simple to make. I used the same border to match the theme and wrote in the labels with the text tool in Silhouette Studio. This part of the project is a print-and-cut. So I printed out the cards, and then the Silhouette Cameo cut them for me.The cut line (red line) is twice as tall as the label, so you can fold the card in half, and it’ll stand up. You can cut them with a paper cutter too, but the Cameo makes them just right. The folded tent cards are 3 inches wide by 2 inches tall, so the cut rectangle is 3″x4″. Blank PDF printable tent cards are at the bottom of the post. To create the signature photo mat, all I needed to know is how big the ultrasound picture is. Then I created a 2″ border around it, so guests would have enough room to sign. 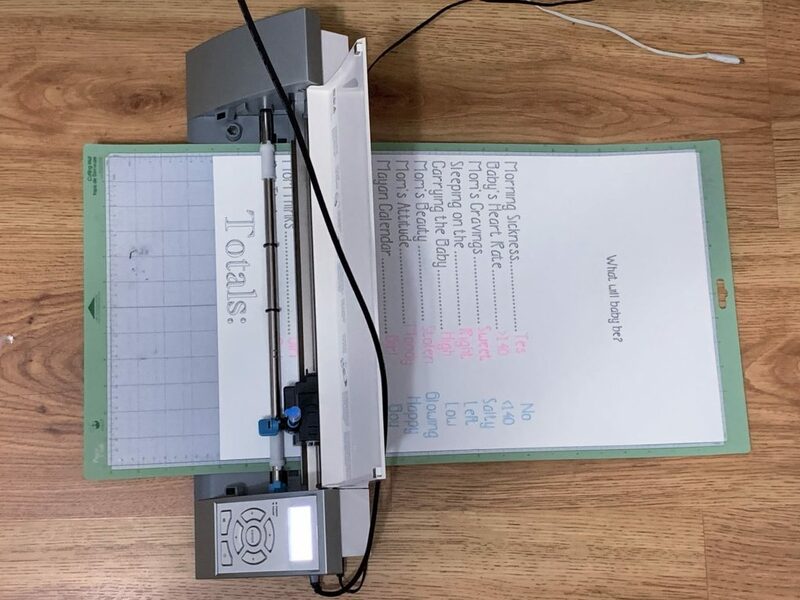 I created the photo mat as a print-and-cut as well and used the Silhouette Cameo sketch function to write the title and date on the top of the frame. The frame is printed on white card stock and the cut lines (red lines) are set with an internal and external offset to make a white border. This will also go in baby’s scrapbook, so I didn’t make it to fit in a wooden frame. However, if you want to frame yours, simply make the overall size of the mat to fit inside the wooden frame. A PDF printable of the photo mat is at the bottom of the post. 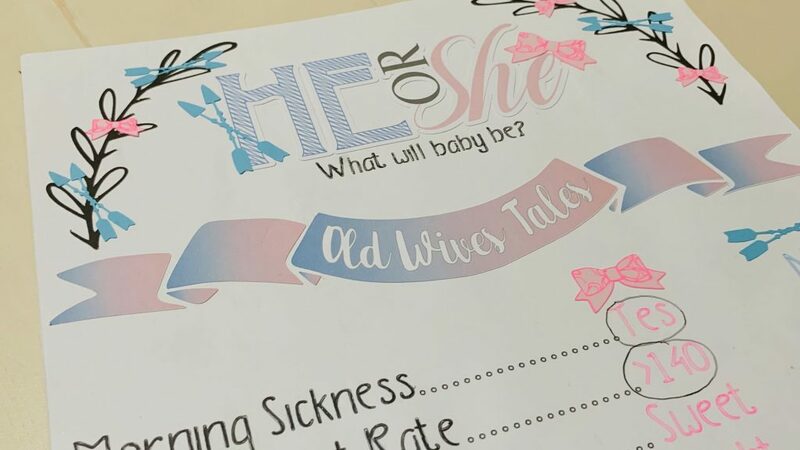 When my sister and I were discussing the plans for her party, we knew we had to have a poster with the Old Wives Tales. I had to ponder this one a bit. It had to be a poster, a big display everyone could see. 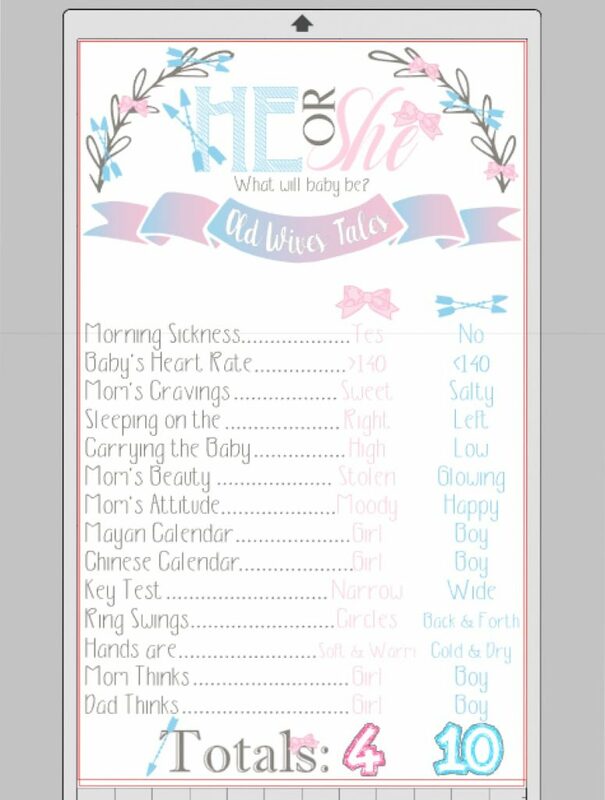 I designed the poster in Silhouette Studio but I wasn’t quite sure how I was going to build it. I knew I could cut out the bigger elements, but that won’t work with the smaller fonts. And, I didn’t want to hand write it. Finally it hit me. 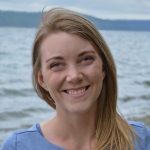 I cut down a white poster board to 12″ in width and ran it through my Silhouette Cameo. I moved the Cameo to the floor it give it enough room to move around the cutting mat. It worked amazing. 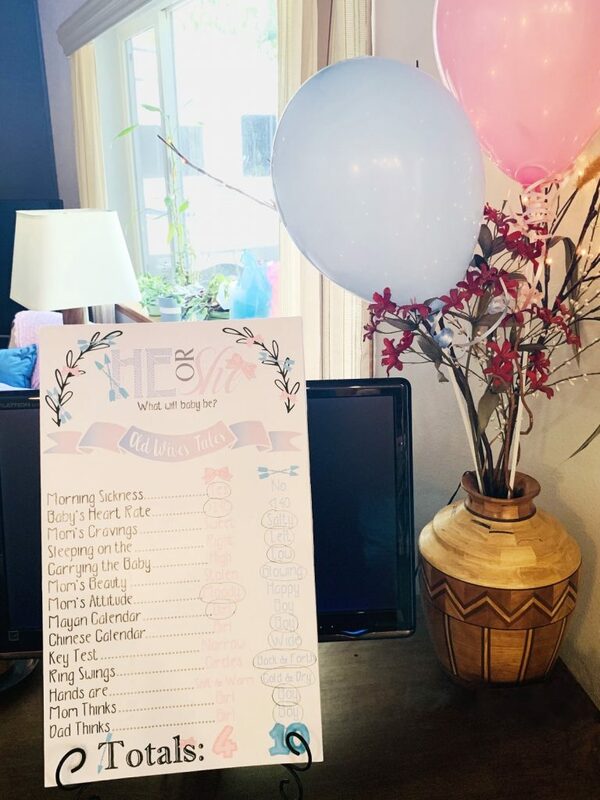 Using the sketch function, with grey, pink, and blue pens, the Cameo wrote out all the Old Wives Tales for me (in beautiful straight lines and perfect handwriting). The machine also wrote “totals” for me, and I colored it in by hand using the same pen. I circled the correct answers by hand. The heading and subheading were print-and-cut designs. I used textured card stock for the leafy arches and blue and pink card stock (enhanced with sketch pens) for the bows arrows and numbers. I glued all the card stock elements to the poster using scrapbooking glue. Once the poster was dry, I glued the whole thing to white foam-core board, so it can really stand up by itself. I created a PDF printable version of the poster available at the bottom of the post. Most of these fun decorations turned into keepsakes my sister will show her baby one day (even the cake topper).